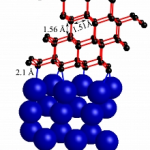 Making cheap diamonds; stronger graphene; shrinking the lowly capacitor. Graphite and diamonds are two forms of the same element–carbon. In graphite, carbon atoms are arranged in planar sheets and the material is soft. On the other hand, diamonds consist of carbon atoms that are bonded in all directions, making these structures extremely hard. Using both technologies, Stanford University and SLAC devised a cheap way to enable diamond-like films for use in electronic devices, sensors and even cutting tools. Researchers took sheets of graphite to make graphene. The top layer was exposed to hydrogen, which, in turn, altered the structures from graphite to diamond-like materials. In the lab, researchers loaded a platinum support with up to four sheets of graphene. They added hydrogen to the topmost layer. With the help of X-rays from SLAC’s Stanford Synchrotron Radiation Lightsource (SSRL), researchers found that hydrogen initiated a domino effect. Graphene consists of a single layer of carbon atoms packed in a honeycomb structure. The material has one hundred times greater electron mobility than silicon and is more durable than steel. Graphene has at least one issue: It does not have a band gap. Rice University and Samsung have separately taken steps to bring graphene one step closer into the mainstream. In one effort, Rice University has devised a hybrid material called rebar graphene. The material combines carbon nanotubes and graphene. Carbon nanotubes have been used to reinforce bulk materials such as polymers, ceramics, and metals. 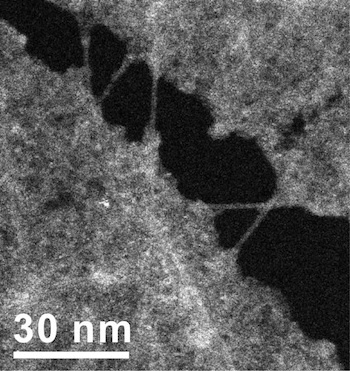 In this case, researchers from Rice have set carbon nanotubes into graphene, which mimics how steel rebar is used in concrete. The hybrid material also preserves and boosts the electrical and mechanical qualities of both. To devise rebar graphene, researchers spin-coat, heat and cool single- or multiwalled carbon nanotubes on copper foils. 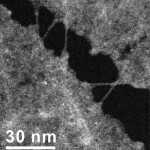 The carbon nanotubes are used as the carbon source. When heated, the carbon groups decompose and form graphene. The nanotubes partially split and form covalent junctions within the new graphene layer, according to researchers. Rebar graphene can be free-standing on water and transferred onto target substrates without needing a polymer-coating. Rice chemist James Tour said the hybrid material could be a cost-effective replacement for indium tin oxide (ITO) used in displays and solar cells. In separate effort, Samsung Electronics and Sungkyunkwan University have devised a synthesis method to speed up the commercialization of graphene. The new method synthesizes large-area graphene into a single crystal on a semiconductor, thereby maintaining its electrical and mechanical properties. Researchers from the two entities devised a wafer-scale growth of wrinkle-free, single-crystal monolayer graphene on a silicon wafer. This was accomplished using a hydrogen-terminated germanium buffer layer. The anisotropic twofold symmetry of the germanium surface allowed unidirectional alignment of multiple seeds. 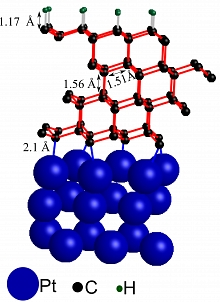 These were merged to uniform single-crystal graphene with predefined orientation. “Furthermore, the weak interaction between graphene and underlying hydrogen-terminated germanium surface enabled the facile etch-free dry transfer of graphene and the recycling of the germanium substrate for continual graphene growth,” according to researchers. The IC industry is struggling to scale the lowly capacitor in DRAMs and other devices. In response, researchers have devised a way to make nanocapacitors. The National Institute for Materials Science and Shinshu University in Japan have developed a way to shrink the ultrathin capacitors using a LEGO-like approach. Researchers used conductive Ru0.95O20.2- and dielectric Ca2Nb3O10- nanosheets as core device components. By using a solution-based assembly process, they created a sandwich consisting of layers of two different types of oxide nanosheets to produce an ultrathin capacitor. The new capacitor has a capacitance density of ~27.5μF cm-2. This is 2,000 times higher than that of currently available commercial products, according to researchers. The bottom electrode consisted of conductive Ru0.95O20.2–based nanosheets. They were assembled on a quartz glass substrate through a sequential absorption process with polycations. The top electode consisted of Ca2Nb3O10–based nanosheets. They were deposited using a so-called Langmuir–Blodgett technique to serve as a dielectric layer. The deposited nanosheet films were combined using standard lithography and sequential absorption processes. The multilayer buildup process was monitored by various characterizations, such as atomic force microscopy (AFM), ultraviolet–visible absorption spectra, and X-ray diffraction data.